“…Of course, he’s not a conservative. He was for Nancy Pelosi, before he was against Nancy Pelosi…celebrity is everything in this country if these guys don’t learn how to play the media the way Barack Obama played the media last election cycle and the way that Donald Trump is playing the election cycle–we’re going to probably get a celebrity candidate. In other words, Trump wanted Nancy Pelosi to be speaker of the House and Harry Reid the Senate majority leader. So maybe he came to regret it after Reid and Pelosi rammed through Obamacare? Apparently not. In 2010 — immediately after the passage of Obamacare — Trump continued to donate to Reid. Trump has donated at least $10,400 to Reid, including $4,800 for his 2010 race against Sharron Angle — a victory that helped keep the Senate in Democratic hands and Reid as majority leader. So Trump continued to support Reid as majority leader in the election immediately after the passage of Obamacare. Trump also gave $50,000 to another Obamacare architect, Rahm Emanuel — the former Obama White House chief of staff — for his campaign to become mayor of Chicago. He gave $5,500 to John Kerry and $7,000 to the late liberal icon of the Senate, Ted Kennedy (D-Mass.). Other Democrats who have benefited from Trump’s largesse include Sen. Charles Schumer (N.Y.), Sen. Frank Lautenberg (N.J.), Rep. Charlie Rangel (N.Y.) and Sen. Hillary Clinton (N.Y.). A major issue in the 2016 election will be allegations of corruption surrounding donations to the Clinton Foundation. But it will also be hard for Trump to make an issue of that since he gave at least $100,000 to the Clinton Foundation. So, Trump was on the side that helped sow the seeds for Obamacare. That's great. As for the celebrity bit, that’s certainly playing out. As I’ve said before, Trump has tapped into a general frustration with the current political climate. The Trumpmentum that began when the billionaire made illegal immigration a cornerstone of his campaign plays into the larger narrative of the abandonment of the rule of law that has occurred under the Obama administration. At the same time, both parties have been unable to do much on immigration, and the Republicans did mull extending subsides to Americans who signed up under the federal exchanges if they were gutted by the then-pending King v. Burwell decision. Not exactly a profile in courage. Yet, again, Trump is an entertainer; an entertainer with penchant to switch positions if it means expanding his name recognition and brand. Maybe that’s fine in business, but it could come off as the work of a charlatan in politics, especially when he was once diametrically opposed to the very principles of the party (or the movement) he hopes to lead in the 2016 election. Yes, Breitbart was a liberal. The grilling of Clarence Thomas by the Senate Judiciary Committee turned off Breitbart to what he described as his default liberal disposition. Yet, Mr. Breitbart never ran for office. He never gave thousands of dollars to Democrats. He was certainly never “cozy” with the Clintons like the Donald. There was no self-serving need to become pro-life, pro-Second Amendment, and anti-Obamacare. Breitbart simply moved away from the cesspool of the left on his own accord. As for Reagan, yes, he was a Democrat until 1962. The Democratic and Republican parties were very different than they are today (of course), and even Trump put Reagan in the crosshairs* when he wrote “The Art of the Deal” in 1987. Trump later came to “really like” Reagan when he decided to dabble again in national politics. In other words, when the time called for it. When the time called for Reagan to explain his shift in views, specifically on abortion, he wrote a book about it. Trump just gave some “rambling interviews,” according to the Federalist. 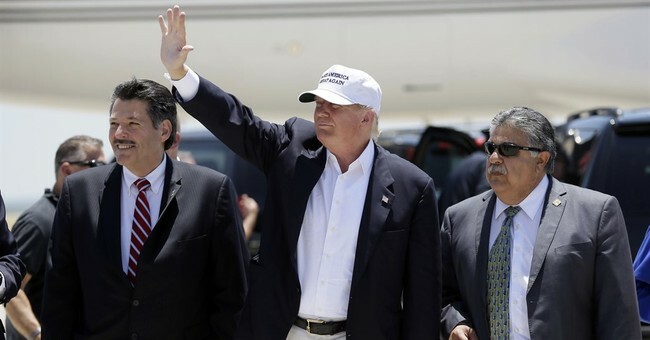 The Donald visited Laredo, Texas for a tour of the southern border in his campaign to “Make America Great Again.” He wore a hat to make that absolutely clear, while hosting a press conference outside a women’s bathroom. At his final stop, he thanked the Border Patrol, but not before saying "This is about you, not about me" as he left the podium. Trumpmentum will continue, and the Donald's supporters are reportedly hard to nail down concerning polling. I guess that's a plus if you're in that camp. The Fox News debate is on August 6; I'm sure it will be a highly entertaining event for everyone. *Yes, the link is to a Think Progress piece, but even broken clocks are right twice a day.